Unlock the once closed door to Cuba on luxury tours and discover an eclectic blend of colonialism and Caribbean charm just under 100 miles south of the United States. From the moment you spot a '57 Chevy or catch the waft of cigar on the breeze, you'll know your luxury vacations in Cuba have begun with cities, such as: Havana, Cienfuegos and Santa Clara, promising no end of exhilarating encounters. 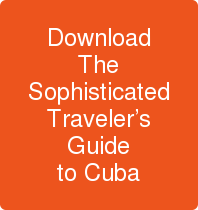 Iconic revolutionaries, literary greats and historic sites, known to the world over for their political and cultural context, help to create Cuba luxury journeys on a breathtaking scale.